Chauncey Kalāokalanikamālamalamaokekuahiwiamekekai Palenapa Pacheco Lindsey-Asing hails from the cool uplands of Waimea, Hawai‘i. The eldest of four sons, Chauncey was born to Justin Asing of Papakōlea, Oahu and Almyra (Lindsey) Asing of Waimea, Hawai`i. He studied Hawaiian Perspectives of Natural Resource Management at the University of Hawaii at Mānoa and obtained a position with the O`ahu Army Natural Resource Program (OANRP). 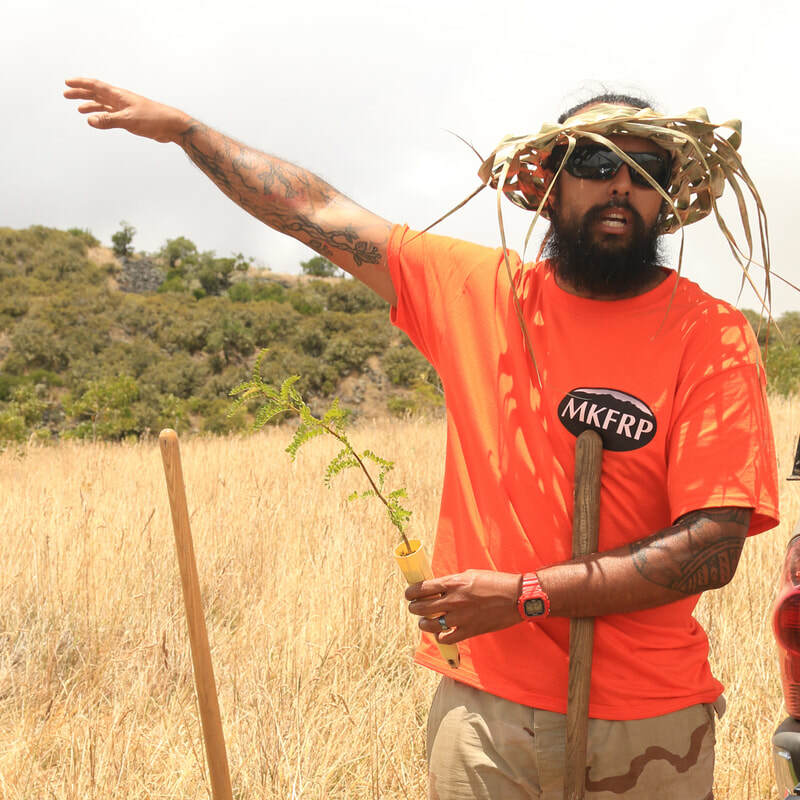 While a Senior Natural Resource Specialist for OANRP, Chauncey accepted an opportunity to move home to Hawai`I island and serve as the Project Coordinator; Wildlife Biologist for DOFAWs Mauna Kea Forest Restoration Project. He is a husband to Kayla Asing, father to Kahalekulu and Kaluhea Asing and is a student of hula, Hawaiian culture, the environment and his profession. Clyde Bailado was born and raised in Paʻauilo, Hāmākua, Hawaiʻi, and is the son of Primo & Mildred Travis Bailado of Kūkaʻiau and Kainehe, Hāmākua. He is a former truck driver for the Hāmākua Sugar Co. and is currently a Highway Maintenance Supervisor for the State Highways Division, West Hawaiʻi. Clyde is a lifetime resident of Hāmākua, who enjoyed fishing and hunting in his younger days. He is an avid softball player, a father and grandfather, and a founding member of huiMAU. Valerie Miranda Peralto was born and raised in ʻUmikoa Village on Kūkaʻiau Ranch in Koholālele, Hāmākua, Hawaiʻi. She is the daughter of Daniel & Vera Miranda, the wife of Joel Peralto, a mother of three children, and a grandmother of two moʻopuna. She is jointly owns Peralto & Co. CPAs Inc. with husband, Joel, and has been practicing accounting on Hawaiʻi Island for over thirty years, where she has been a lifetime resident. Born and raised in Paʻauilo, Hāmākua, Alice is the daughter of Benigno and Asuncion Dela Cruz. She worked as an Oncology Nurse at North Hawaiʻi Community Hospital for 18 years, and at Straub and Pali Momi Hospitals on Oʻahu before that. She has volunteered with the American Cancer Society - Reach for Recovery Program, and also with Relay for Life. Alice is a founding member of huiMAU, and her commitment to the collective health and well-being of our community continues through her networks with other nurses and her work to help improve the mission and vision of our community hospital. Zelda K. Bailado Dela Cruz is the daughter of Primo & Mildred "Grammie" Travis Bailado, born and raised in Paʻauilo, Hāmākua, Hawaiʻi. Zelda now resides in Hilo, Hawaiʻi with husband Tommy Dela Cruz. She is currently a Supervisor for a Credit Union and has 40 years of Credit Union experience along with extensive involvement in community projects. She is also a founding member of huiMAU. Dr. Kū Kahakalau is a native Hawaiian educator, researcher, song-writer, and expert in Hawaiian language, history and culture, and founder of Ku-A-Kanaka Indigenous Institute for Language and Culture. Dr. Kahakalau, her husband Nālei and their daughters ‘I‘inimaikalani and Pōlanimakamae, reside in Kukuihaele, Hāmākua, Hawai‘i. 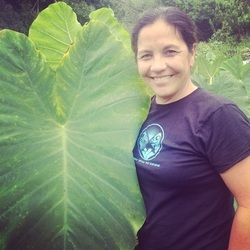 For the past 20 years, Kū and her family have planted taro and other utilitarian plants in Waipi‘o Valley, teaching young men and women their roles and responsibilities as 21st century Hawaiians, and sharing with thousands of learners from around the world, the value and the importance of aloha ‘āina. Shaelene Kuʻulei Kamaka'ala was born and raised in the ahupuaʻa of Punaluʻu, Koʻolau Loa, Oʻahu. Shae graduated from the Kamehameha Schools in 2005 and completed her Associate’s of Art Degree in Political Science from Marymount College in 2007, her Bachelor’s Degree in Political Science from the University of San Diego in 2009, and most recently, her Juris Doctor Degree from the William S. Richardson School of Law in 2014. As a board member of Hoala Aina Kupono, she is the joint-co-founder of the Kahana Kilo Kai program, a grassroots and community-based ocean monitoring program. Kahana Kilo Kai’s vision is to build the community’s capacity to restore Kahana’s konohiki fishery and bring abundance back to the bay. She also represents Oʻahu as a member of the E Alu Pū Council, a network of grassroots communities caring for their place. Shae has had the privilege of working with and learning from communities statewide, while championing community-based stewardship of Hawaiʻi’s nearshore fisheries. Most recently, she serves in the public sector as the Community Based Fisheries Area (CBFA) Coordinator for DLNR DAR. In this role, Shae is working with all sectors to tackle complex issues to build meaningful co-management relationships amongst stakeholders for Hawai'i's nearshore fisheries. Born and raised on O‘ahu, Derrick Kiyabu has returned to Hawai‘i Island where he began studying agriculture at Hawai‘i Community College after high school. He has over 15 years experience working and studying in the fields of agriculture and community development. Derrick is the Program Coordinator and Farm Coach for GoFarm Hawai‘i, a farmer training program based at Namoku, near Honoka‘a. He resides in Kaumōʻali, Hāmākua Hikina, Hawai‘i. He kama ʻo Liana Kalaiokamanu Iaea Honda na Shermaih Kahuakai Iaea, Jr., no Kalihi me Gunda Pedersen no Kenemaka. No Waiʻanae mai ʻo ia. He kumu hula, a he kumu kula ʻo ia kekahi. Liana Kalaiokamanu Iaea Honda is a child of Shermaih Kahuakai Iaea, Jr. of Kalihi and Gunda Pedersen of Denmark. She is originally from Waiʻanae, and now resides in Pōhākea, Hāmākua. Liana is also a kumu hula, a former teacher at Laupāhoehoe Community Public Charter School, and currently works as the manager of the Native Hawaiian Health Program at North Hawaiʻi Community Hospital. ​Lisa Malia Yang was born in Torrance, California and raised in Hilo, Hawai’i. She is the daughter of Henry and Elizabeth Yang of Hilo. While a student in the joint J.D./M.B.A program at the Williams S. Richardson School of Law and the Shidler College of Business at the University of Hawaiʻi at Mānoa, she focused her studies on Native Hawaiian law. She is currently practicing law as an attorney in Honolulu.